Try a new winter sport! Fat bikes are specially-made bicycles that accommodate ultra-wide tires which can be run at very low pressure. The combination of very wide tires and less than ten pounds of pressure allows fat bikes to roll over soft, slippery surfaces like snow. Fat bikes are one of the fastest-growing segments of the bicycle industry. They provide a great way for cyclists to stay in shape during the winter season. Simply bundle up like you would for skiing and get out and ride! No waxing required, and for the passionate cross-country skier, it provides another way to cross-train. Fat bike trails are assessed day by day, taking into account snow conditions and user compatibility. Information on what trails are open to fat bikes will be available daily on our Methow Trails grooming report. A valid Methow Trails day pass will be required for fat bikes at all locations, except for Big Valley. 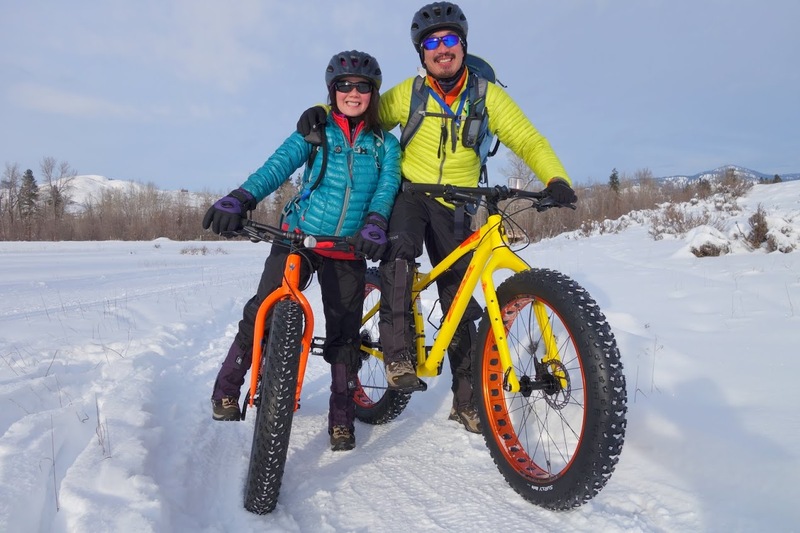 Fat bikes are available for rent at Methow Cycle & Sport and Cascades Outdoor Store located in Winthrop and in Mazama, Goat's Beard Mountain Supplies and North Cascades Cycle Werks. Reservations are recommended! Methow Cycle & Sport also provides rack adaptors for customers who wish to transport rental fat bikes to the riding area of their choice. Riders need to confirm trails are open for riding daily on the Methow Trails grooming report. Riders must display a trail pass when riding on groomed trails where passes are required. Fat Bike Day passes are $10, Fat Bike Season passes are $50. If you have a ski day or annual pass, you are good to go for all uses. Purpose-built fat bikes only! All bikes tires must be wider than 3.6 inches and have pressure less than 10 psi. No exceptions! Riders yield to all other users, stay out of the classic ski tracks, and give skate skiers a wide berth. Stay on your bike. Footprints damage the trail.